beThe First World War was an unprecedented catastrophe that killed millions and set the continent of Europe on the path to further calamity two decades later. But it didn’t come out of nowhere. With the centennial of the outbreak of hostilities coming up in August, Erik Sass will be looking back at the lead-up to the war, when seemingly minor moments of friction accumulated until the situation was ready to explode. He'll be covering those events 100 years after they occurred. This is the 110th installment in the series. In March 1914, the Balkan cauldron was simmering away, as Austria-Hungary faced fresh difficulties in Albania and Serbia and Montenegro threatened to merge, promising further instability. 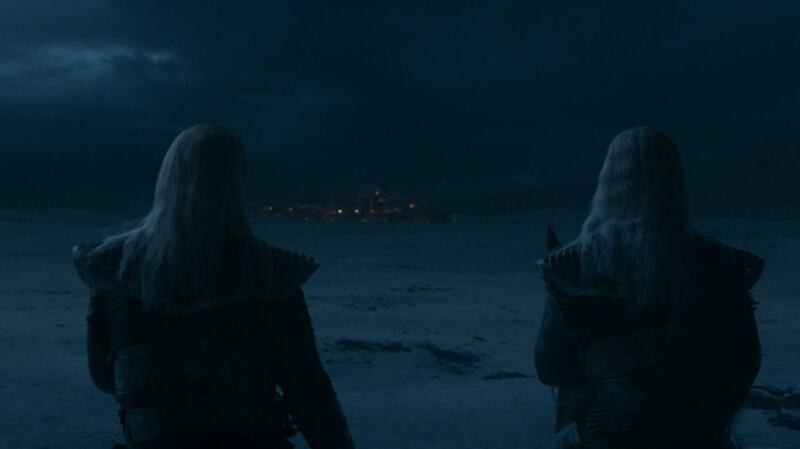 But it was a plot unfolding behind the scenes that lit the fuse for the greatest conflict in history. At first glance March 7, 1914 marked a diplomatic success for Austria-Hungary, as a German aristocrat, Prince Wilhelm Friedrich Heinrich of Wied, arrived in the Albanian city of Durazzo to take the throne of the new nation. This was supposed to be the culmination of several years of diplomacy and saber rattling by Austria-Hungary’s foreign minister Count Berchtold, who persuaded the other Great Powers to create a new, independent Albania to deny Serbia access to the sea after the First Balkan War (the Austrians feared Russia might use a Serbian port as a naval base). The only problem with the scheme was that it completely ignored reality: The Prince of Wied commanded neither troops nor loyalty in Albania, and his “authority” was confined to Durazzo, propped up by a small Dutch-Austrian force. It wasn’t long before a powerful tribal leader, Esad Pasha Toptani, began plotting rebellion in the hopes of grabbing the crown. In March 1914, a ragtag group of part-time high school students, pamphleteers, and coffeehouse intellectuals began plotting a murder that would shake the world to its foundations—although at the time none of them had any idea what its real impact would be. While many details remain murky due to conflicting accounts, historians have pieced together the rough outline and timing of the plot, including the role played by members of Unity or Death, an ultranationalist cabal directed by Serbian military officers in Belgrade also known as the Black Hand, and Young Bosnia, an underground organization in Austrian Bosnia. For several years, a Bosnian Serb teenager and member of Young Bosnia, Gavrilo Princip (above, top row, left), had been drifting back and forth between Sarajevo, the provincial capital of Austrian-controlled Bosnia, and the Serbian capital Belgrade, where he was supposedly attending high school but actually spent most of his time talking politics with other radical Serbian nationalists in grimy cafés. On March 13, 1914, after a visit home to Bosnia Princip returned to Belgrade, where he was soon to be found in his usual haunts. In late March, one of Princip’s café colleagues, Nedjelko Čabrinović (above, top row, right), supposedly received an envelope with no return address, containing a clipping from a Bosnian or Croatian newspaper about Archduke Franz Ferdinand’s planned visit to Sarajevo on June 28—known to Serbs as Vidovdan, the anniversary of the Serbian defeat by the Turks at the Field of Blackbirds in 1389. In this version of events, Čabrinović showed the clipping to Princip, who shared his indignation at the apparent insult in the visit’s timing, and on March 27 the friends swore a secret oath to assassinate the heir to the Austrian and Hungarian thrones. Meanwhile Princip’s best friend in Sarajevo, a nationalist newspaper editor named Danilo Ilić (who had recently joined Unity or Death, also known as the Black Hand—above, top row, center) also received word about the Archduke’s planned visit around this time—again, supposedly from a newspaper clipping sent to him anonymously. However he learned about it, Ilić was thinking along the same lines as Princip by late March, when he met his friend Muhamed Mehmedbašić (not pictured), a Bosnian Muslim and fellow member of Young Bosnia, who was still hoping to carry out an earlier plot to assassinate Oskar Potiorek, the Austrian governor of Bosnia. On March 26, 1914, Ilić told Mehmedbašić that the plan to kill Potiorek had been canceled by the Black Hand’s shadowy leadership—but added that a new plot was being organized against the life of the Archduke. Princip later claimed that he wrote to Ilić around Easter (April 12, 1914) to recruit him into the conspiracy, only to find that Ilić was already considering a similar plan. 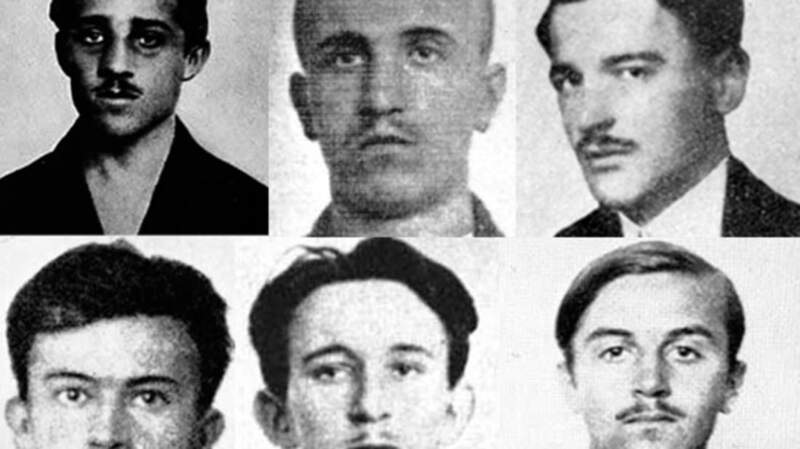 In the following weeks the conspiracy grew as Princip and Čabrinović recruited their friend Trifun Grabež in Belgrade (above, bottom row, left), while Ilić enlisted Vaso Čubrilović (bottom row, center) and Cvjetko Popović (bottom row, right), both living in Sarajevo. Some of the conspirators later denied that they had any outside help organizing the “outrage” (as terrorist attacks were termed): At their trial, Čabrinović claimed, “In the company we frequented the conversations always turned on outrages… Nobody told us straight out: ‘kill him,’ but in those circles we came round to the idea by ourselves,” and Princip insisted, “The idea of it originated with us and it is we who carried it out.” But they were almost certainly inspired and directed by members of the Black Hand, led by the chief of Serbian military intelligence, Dragutin Dimitrijević, codename Apis (below, left). For one thing, the plotters needed weapons; thus Princip got in touch with a middle-aged nationalist radical named Milan Ciganović (below, right), an employee of the Serbian national railway who’d fought in the Balkan Wars and belonged to the Black Hand. Ciganović sometimes worked for Major Vojislav Tankosić (below, center), who was in turn the right-hand man to Dimitrijević. Ciganović obtained four pistols and several small bombs from a Serbian military armory, which Princip claimed he sent to Ilić sometime in April, and it seems impossible that Ciganović would have done this without the knowledge and approval of Dimitrijević. Furthermore, the whole story of anonymous newspaper clippings seems rather suspicious, as does the coincidence of Princip and Ilić spontaneously arriving at the same idea; while the clippings may have played some role in advancing the conspiracy (perhaps as a previously agreed signal) it seems more likely the entire plan was coordinated from an earlier date, following the failure of the plot against Potiorek. Through his spy network Dimitrijević likely heard of Franz Ferdinand’s visit to Sarajevo shortly after the Archduke agreed to the trip in mid-February, and well before it was publicized in the newspapers. 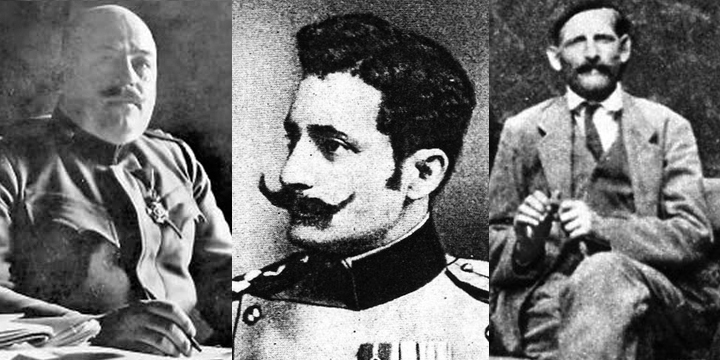 According to several other accounts, Princip was in contact with Tankosić and Ilić as early as January, and Tankosić told him that the Black Hand had decided to kill the Archduke soon after. Serbia’s civilian government smelled a rat: On March 18, Serbian Prime Minister Nikola Pašić ordered an investigation of the Black Hand, which he rightly suspected of plotting a military coup against him because of his moderate stance towards Austria-Hungary. Eventually Pasic got wind of the plot against the Archduke from Ciganović, who was apparently an informer for the government inside the Black Hand. But it was all too little, too late. Meanwhile on March 16, 1914, the bellicose Austrian chief of the general staff, Conrad von Hötzendorf, once again called for war in a conversation with the German ambassador to Vienna, Baron Heinrich von Tschirschky. But Tschirschky politely reminded Conrad that a key figure stood in the way—Archduke Franz Ferdinand, who opposed any suggestion of preemptive war.